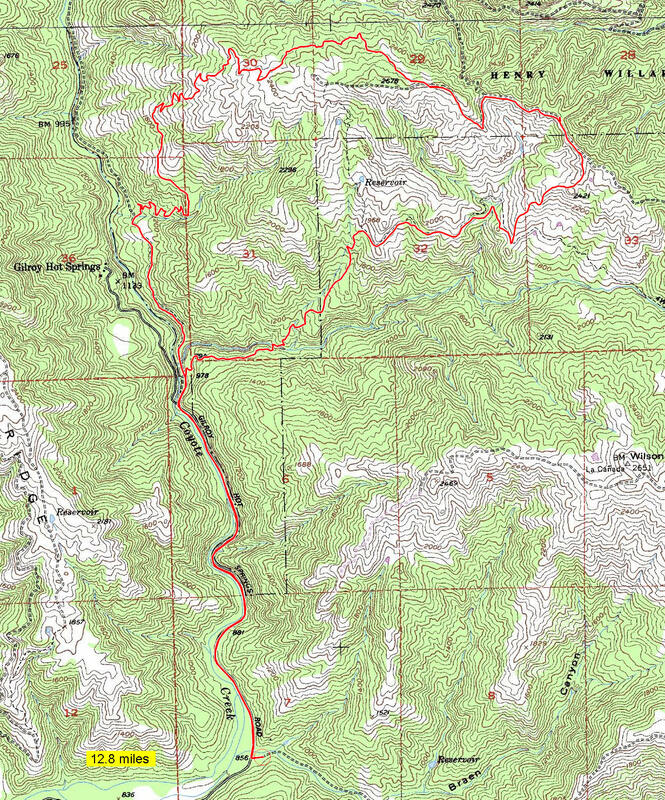 Henry Coe is by far the largest park listed on this website and one of the remotest. While not all of it is open to mountain biking, its more than 130 square miles of total land area easily dwarfs any individual city around the Bay Area (like San Francisco, at 49 square miles) with the notable exception of San Jose. It features many excellent bike-legal singletrack trails, though it'll frequently make you work hard to get to them: its fire roads are notorious for steepness. This particular route has you starting from the Hunting Hollow parking lot. Parking in this lot is subject to a fee, which was $6 in 2017. You pay by putting cash in an envelope and depositing it in a box, so bringing with you a pen and exact change (and checking the current fee online) would be highly recommended. Unfortunately this lot comes with no options for overflow parking nearby. Thankfully, it's a fairly large lot and it features enough space even for the creation of a pair of head-in parking rows along the middle of the lot. But, if this lot is completely filled up, the closest fallback option that I would consider arguably legitimate is to park in the Coyote Lake and Harvey Bear Ranch County Park and ride in from there. The ride begins (and ends) with a two-mile segment on the paved Gilroy Hot Springs Road, which is open to traffic. This mildly curvy road segment is effectively flat (though not perfectly so). It follows the pretty Coyote Creek along the bottom of a nice canyon with moderate tree cover. Traffic is virtually non-existent on this stretch of road, since the public road dead-ends at the end of this segment. So, as far as road segments added to singletrack rides go, this one is not such a bad one at all. The "real" ride consists of a mostly singletrack climb and descent. It's a short one. The climbing portion traverses mainly Anza and Jackson trails via many switchbacks. The climb is a serious one. 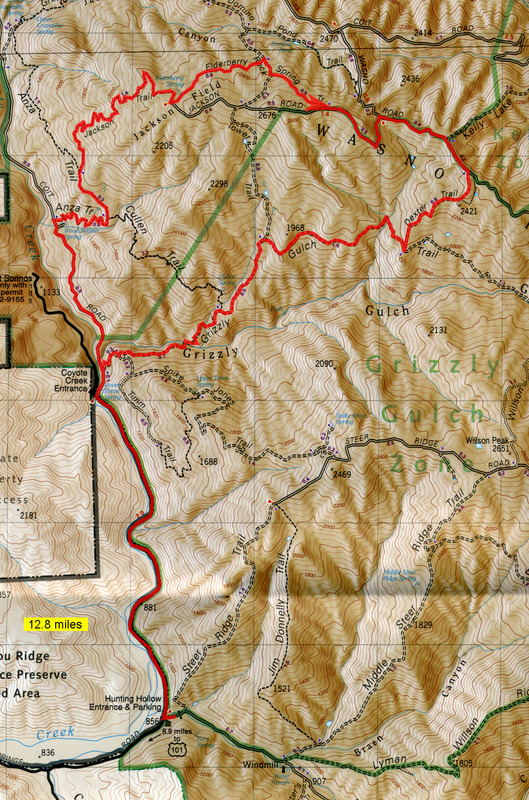 It brings you to the brief ridgetop segment of the ride where you ride a few short segments of fire roads and where vista points in various directions are available along the way. Then the short, extra steep, but fun descent on Dexter Trail hands you off to Grizzly Gulch Trail. This trail initially continues flatly on average with minor ups and downs for maybe a mile before it undergoes a jekyll-to-hyde transformation once again and starts a steep dive back toward the creek bed. The first half of this one-mile descent is its steeper part, at an average grade of at least -18%. There are a couple of stretches along this descent that deserve some extra caution. When you encounter another couple of stream crossings, it's a sign that you're almost at the end of the ride. There is about a quarter mile of gentle uphill pedaling under tree cover past those crossing, after which you quickly connect back to where you had begun the loop portion of the ride and you're only left with the paved descent on Gilroy Hot Springs Road.